Figure 6.26 Sketch map of the Hell Creek area, Garfield County, Montana, south of the Fort Peck Reservoir (modified from Hotton 2002). Localities are: 1, Seven Blackfoot; 2, Billy Creek; 3, Herpijunk Northeast and Iridium Hill; 4, Rick's Place; 5, Lerbekmo. Reprinted by permission. boundary and has been the site of much controversy over the timing of dinosaur extinction (Archibald 1996). Information on the megafossil paleobotanical record from eastern Montana is sparse, especially in comparison with that from western North Dakota. Palynological data are extensive, however. 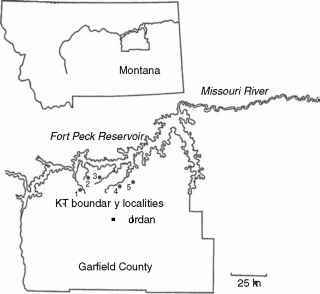 Some of the earliest published information on the effects of the K-T boundary event on plants anywhere in the world comes from eastern Montana, and palynology provides a well-documented picture of the extinction. A major study was conducted in the late 1980s, but was published only recently (Hotton 2002). In taxonomic detail, it exceeds the palynological study in North Dakota (Nichols 2002a), treating almost three times as many species of fossil pollen and spores, yet the changes across the K-T boundary are strikingly parallel in degree. To summarize before reviewing the key published references, a substantial portion of a diverse flora represented by angiosperm pollen suffered major decline or total extinction at the K-T boundary in this part of the Williston Basin. The boundary is marked by the well-known iridium abundance anomaly at eight localities near the Fort Peck Reservoir. 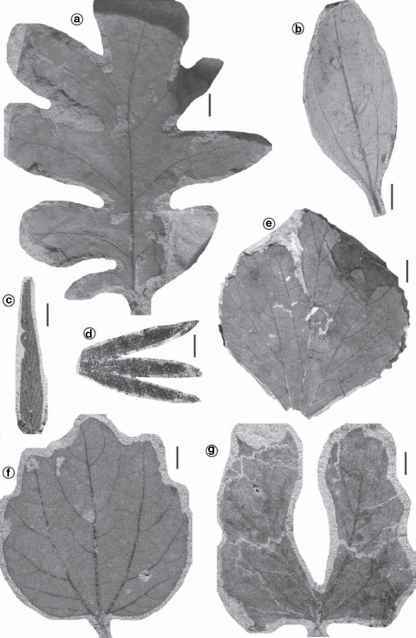 The Maastrichtian plant megafossil record in eastern Montana is relatively poorly sampled. Brown (1939) described a small flora from the Colgate Member of the Fox Hills Formation near Glendive. Shoemaker (1966) described a megaflora of 33 species from seven localities in the Hell Creek and "Tullock" (Fort Union) formations near the Fort Peck Reservoir. His data, though sparse, indicate that 85% of Hell Creek species are absent from the Tullock in his study area, and 50% are absent from the Paleocene regionally. Johnson and Hickey (1990) noted a few Maastrichtian localities in the Fort Peck region and observed that the composition of the Hell Creek and Fox Hills megafloras was similar to that observed in North Dakota. Brown (1962) recorded more than a hundred megafloral localities in Paleocene strata in eastern Montana. Because of the lack of Maastrichtian leaf localities, the megafloral record of the K-T boundary in eastern Montana is vastly under-sampled and it is difficult to conclude much about patterns of megafloral extinction.